Breeze förbi de stora folkmassorna i Versailles på den här 4-timmarsutflykten, inklusive tillträde till hoppa över linjen. Följ din guide genom Louis XIVs slott och trädgårdar, inklusive alla entréavgifter och returresor från centrala Paris. Gör din väg till mötesplatsen nära Eiffeltornet vid din valda avgångstid. Turer är tillgängliga kl 8:15 och 1:40 pm, tisdag till söndag. Mötesplatsadressen är: TRIP Welcome Centre, 41 Avenue de la Bourdonnais, 75007 Paris. 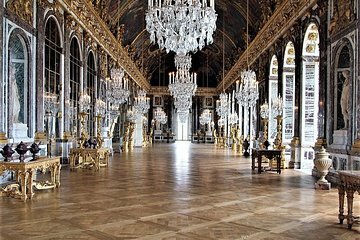 Resa till Palace of Versailles i ett bekvämt turnébil och börja med en guidad tur och en grupp på 18 personer eller färre. Gå genom palatset och lär dig historien, inklusive det faktum att det var hemma för tre av Frankrikes mest berömda kungar i över 100 år. Följ din guide genom Royal Chapel, State Apartments, och den berömda spegelsalen. Efter din interiörtur, spendera du lite fritid i trädgården, en park på 2 000 hektar (809 hektar) fylld med fontäner, statyer och klassisk formell trädgårdsplanering. Du kan till och med få chansen att se Musical Gardens-showen eller fontänerna. Återgå till din ursprungliga avgångspunkt för avhämtning. Michaela was our guide and she was great! She specialized in military history and was VERY knowledgeable. She did a great job of navigating our group through the crowds, and was kind enough to drop us off at Musee D'Orsay afterwards due to the rain! Highly recommend her for this tour. Very easy transportation to and from Paris and plenty of time to tour the grounds. Our guide was great, too. I loved my tour guide - she was knowledgable, funny and witty all at once - thx again great job!!! This is a great tour. Unfortunately, the weather was rainy and cold so we did not get to see much of the gardens. However, the tour of the palace was breathtaking. My sister was in a wheel chair and the driver was amazing! The tour was through Parisd TRIP. Sorry I cant recall his name but he was a gentleman, sensitive and caring. The other tour members were also. Our booking was BR-627769670. This made our tour even more interesting because he was so knowledgeable. Highly recommend! great tour. On our way to the tour they gave us historic of Paris. The tour was good. I felt like it could have been a bit longer. We were only there for a little over two hours. You really only have time to see the Palace. Very little time for the gardens. To me a half day tour should be a few hours at the site, not including drive time. Ricardo was pretty good. Great guide, Zara was able to answe all our questions and gave very interesting and pertinent information. Although the crows were very large she managed to shepherd all of us and provide lots of info. At the end of the tour she drove us back to our hotel. The palace and the gardens are a must. Our guide, Kevin, was awesome. Complaints are that the bus transportation stated air conditioned bus. No actual air conditioning, only an open top bus, which was inadequate considering the temperature that day was 95 F and you are stuck in traffic most of the way. Also, warning that the tour was very short, only 2 hours to see the palace and the grounds. Could have used more time to see all. Terrible experience. Our tour guide, Natalie, started the tour by going out of her way to pick up another person at the Eiffel Tower that she favored throughout the tour. She rushed us through the Palace then told us we only had 50 minutes to view the gardens. When we returned five minutes late, she scolded us and said she was about to leave. We told her that we didn't get to see the dancing water fountains and she told us we needed to come on a weekend for that. However, the tour specifically said the fountains worked on Tuesday's and Saturdays. We had traveled from Amsterdam that day and gotten up very early so we could see them. She then scolded another family who arrived later then us telling them she was about to leave. She said she was in a hurry because the person she did a special pick up for, had to catch a Seine River cruise. Why we had to rush for her is beyond me! Then when we got to the port to drop off the lady for her cruise, she told us we would have wait 20 minutes while she helped the lady get on her cruise! When she returned, she asked where our hotel was. I gave her a card with our hotel address and she tossed it back saying it was too far and she couldn't go out of her way! She then scolded one of the tour participants because he had gotten out of the van. She said she was tired of waiting for the same person. She was upset and as she was backing up, crashed into a taxi!